Portugal was not the only country interested in the emerging lands of the northwest Atlantic. Both England and France were concerned to stake their claims as well, disputing the right of the Pope to divide the world between Spain and Portugal. Like the Portuguese, they were interested in establishing the geography of the region, and were especially interested to find out whether a viable westerly route to Asia actually existed. This was the primary reason for those English voyages which took place after Cabot. By contrast, the French were as interested in the potential of the fisheries, and the other resources which the region had to offer. From Henry Harrisse, Découverte et évolution cartographique de Terre Neuve et des pays circonvoisins 1497-1501-1769: essais de géographie historique et documentaire. (London: Henry Stevens, Son & Stiles, 1900). A series of voyages in the early 16th century established that a continent hitherto unknown to Europeans lay between Europe and Asia. In 1524 Giovanni da Verrazzano, an Italian navigator sponsored by the King of France, sailed from what is now North Carolina to Cape Breton and southern Newfoundland. This voyage showed that the Spanish possessions in the Caribbean and Central America were joined by a continuous coastline to the "New Found Lande" in the north. This finding was confirmed by the Portuguese explorer Estevão Gomes (sponsored by the King of Spain), who in 1524-25 sailed from Cuba to Newfoundland, and by John Rut, an Englishman sponsored by King Henry VIII, who sailed from Labrador to the West Indies in 1527-28. The French then turned to the exploration of the Gulf of St. Lawrence. 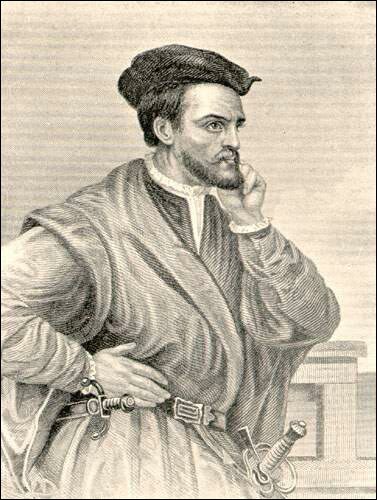 In 1534 and 1535-36, Jacques Cartier made two important voyages, in each case sponsored by King François I. In 1534 he made his landfall at Catalina, Newfoundland, and then sailed north around the Great Northern Peninsula, and through the Strait of Belle Isle. Cartier then sailed along the south coast of Labrador, making the famous remark in his journal that it was "the land which God gave to Cain." From there he sailed southeast to Newfoundland's west coast, which he followed for about 400 kilometres, and then onwards to what we now call Prince Edward Island and eastern New Brunswick before sailing back to France. On his second voyage, Cartier explored the St. Lawrence River and valley, who was to become the focus of French activity in the New World. From Samuel Edward Dawson, The Saint Lawrence Basin and its Border-lands: Being the Story of their Discovery, Exploration and Occupation. London: Lawrence and Bullen, Ltd, 1905. There were no official English voyages after that of John Rut until the 1570s, when a succession of English mariners attempted to find a northwest passage to Asia - that is, a sea route around the top of North America. They had been preceded in 1508-09 by John Cabot's son Sebastian. With vessels supplied by the king, Cabot is thought by many scholars to have entered Hudson Strait and possibly Hudson Bay, before retreating south. Nothing came of this voyage, nor from that of Jean Alfonse, who in 1543 explored the whole Labrador coast from south to north. The next attempt was not until 1576, when Martin Frobisher made the first of three voyages to try and find the passage. These voyages began to delineate the geography of the east Arctic with some accuracy, including Hudson Bay and the most northerly parts of Labrador. But if mariners came further south, – not usually intentional – they were not interested in what Newfoundland and Labrador had to offer, but how to get round the continent to Asia, and therefore sailed to Hudson Strait via Greenland. 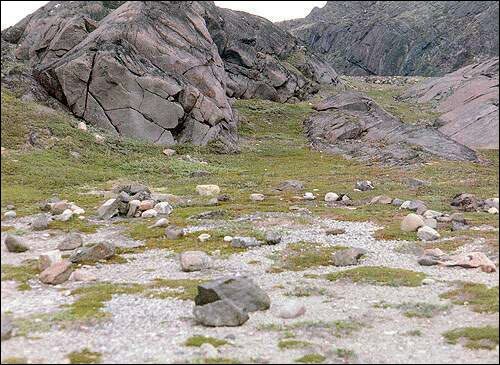 However, John Davis sailed south along the Labrador coast in 1586 - two of his men were killed by Inuit - and again in 1587, giving Cape Chidley its name, as well as Davis Inlet. 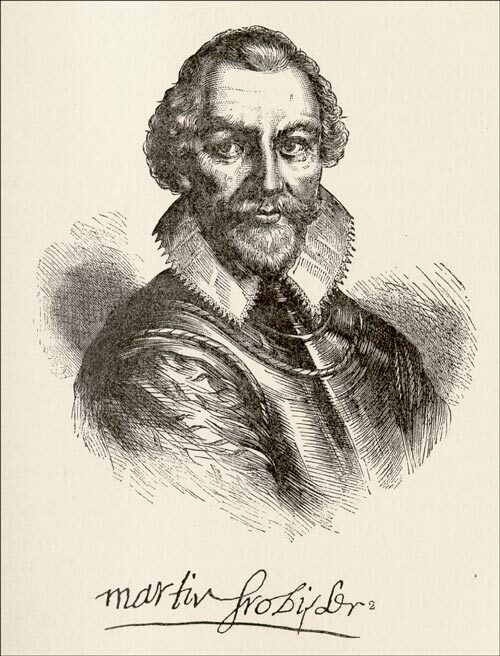 John Knight was forced onto the Labrador coast by ice in 1606, where he and three crew members disappeared, and in 1614 William Gibbons was icebound for ten weeks in Saglek Bay. Attempts on the northwest passage continued for many years afterwards. It was not traversed until 1903-06 by the Norwegian Roald Amundsen in the Gjoa. Photo by Brian Bursey. From Brian C. Bursey, Exploring Labrador (St. John's, NL: Harry Cuff Publications, ©1993) 65. In the long run, the coasts of Newfoundland, Labrador and the Gulf were explored, "discovered" and mapped by fishers and whalers, as much as by the official explorers sponsored by monarchs and chartered companies. 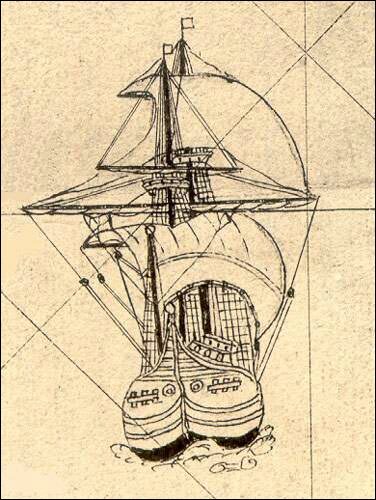 Cartier met French vessels in the Gulf in 1534, and encountered Indians who were obviously familiar with Europeans. By that time, French fishers had been crossing the Atlantic for 30 years. They, with their Basque and the Portuguese counterparts, provided much of the knowledge used by cartographers and exploited by propagandists who, by the late 16th century, were promoting the colonization of North America.